As we began to work the up strike face, we were forced into blasting the upper 8-10 feet of the pegmatite before we could then attempt to mine the mineralized zone. This was somewhat of a novelty. Unfortunately, the upper layer was decidedly barren. In addition it seems that as the pegmatite thickened, rather than there occurring more mineralization of interest, what there was seemed to become diffused through this larger volume. As mentioned, the mineralized zone or garnet line seemed oblivious to this thickening as well. It proceeded unimpressed along its steady 20 or so degree dip into the ground. The extent of its progress is revealed in the two images below. Approximately 100 years separates the two images. The photographers, however, must have been standing in nearly the same place as the background view is nearly identical . The summit of Crooker mountain is visible in both. 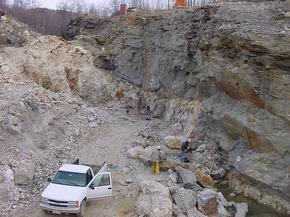 Only the depth of the overburden to reach the pegmatite has changed and of course the ancillary equipment. 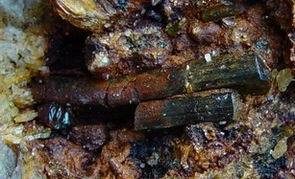 In the image at the left one can see the hoist driven by real horsepower used to remove muck from the pit. 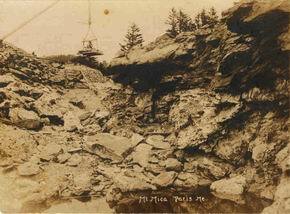 Benching across the up strike face, once the pegmatite was reached, was becoming difficult. The up dip bulge was so sharp, even after it was blasted lower, that standing on the ledge was quite a balancing act. The pitch was so steep that footing was extremely bad. In addition, water was weeping from the upper pit just behind the bulge. We knew the moment freezing temperatures arrived, it would be impossible to work this face. We quickened our pace accordingly. As we drilled each pattern of holes across this 30 foot face, we watched the dust coming up intently. If we drilled lots of schorl our prospects would be more promising in the pocket department. We had not actually drilled into a pocket for quite some time. In fact, except for a couple of glancing blows, we had not seen the drill drop into a sizable cavity since pocket MMP11-04 ( pocket 11). We had found 13 pockets in the interim though. Hence, I took careful note as black dust started appearing just 1 foot or so into the ledge as I drilled my end of the bench on October 20 while Richard worked his end. Through two steel changes, the dust continued to pour up black. When drilling a hole, there isn't much to do other than watch for the steel to break or jam, with subsequent negative consequences, and think about what will soon be exposed by the blast. So in this day dreaming mode watching more black dust come up, I thought to myself, 'If this had been on the pocket 11 end of the pegmatite, the drill would be dropping into a pocket'. No sooner than this thought had been vibrated from deep in my brain, then drill let go dropping into a space and drenching me with cold water. I had been sitting on the drill, so dismounting was not instantaneous but the cold water did provide plenty of incentive. I stopped the drill and called Richard over. It is always interesting at this stage to see what percolates up out of the hole with a few blasts of air from the hammer. 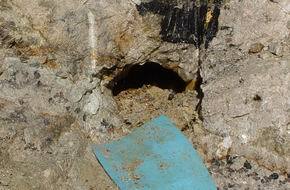 In this case there was copious water, so we knew the hole was not tiny. Our next move required us to drill holes to the side of the one I had just drilled and in front in order to open the pocket with minimal damage. The first drill hole, of course, would not be loaded. In the image, Richard stands by the freshly opened pocket. This pocket was classical Mt Mica, in that the schorl grew above and into the pocket. Notice the two fractures that lead to the pocket. One is rusty and the second one goes behind Richard and up towards the air line. Larger pocket seem to be sitting within a web of such cracks. This pocket was filled with loose grains of lepidolite which has proven to be a promising pocket sign. 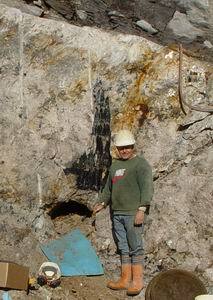 A little digging showed that this pocket, perhaps the size of two bushel baskets, contained blue and pink elbaite. The schorl in the image had grown into the back of the pocket. Its terminal end had first gone to pastel pink than pale blue. The image of the assembled doubly terminated crystal shows interesting color zoning. It starts blue at the top, grades to blue with a reddish interior, then to red, and finally red with a blue core. Pocket 25 produced a host of small blue pencils similar in quality to the pink once from pockets 16 ad 17. It failed to produce a major specimen. The color zoned crystal above was perhaps the highlight of the pocket. 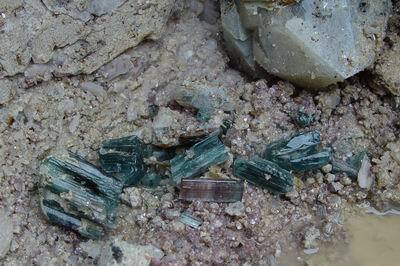 Several feet behind MMP25-04 we found a seamy area that yielded two crystals very similar to the color zoned one. 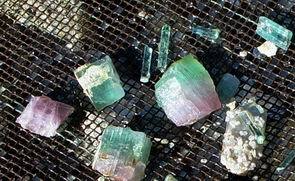 Below is a picture of the two fractures crystals as we found them in the ledge. Since our benches were quite high above the quarry floor and significantly sloped, the onset of frost would render these areas too unsafe to work. If we were going to stretch our mining season, we would have to adopt a new strategy and do it very soon.